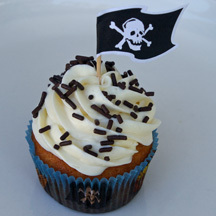 These pirate flag cupcakes use Wilton’s cupcake liners and flags, and are a quick way to complete the perfect pirate party. Little (and big) swashbucklers will love them. Also great for a Pirates of the Caribbean party or grownups’ event. What You Need: 1 cupcake; white frosting; Wilton cupcake liner and flag (sold in a set); chocolate sprinkles; pastry bag, 1M metal tip. How to Make It: Use tip to make 1M swirl (squeeze steadily in concentric circles, starting at the rim of the cupcake and working inward and upward). Sprinkle with chocolate jimmies. Plant pirate flag on top. In honor of the start of the college and NFL football seasons, make these cupcakes using foil-wrapped chocolate footballs and paper flag picks. Or, serve them at your Super Bowl party! 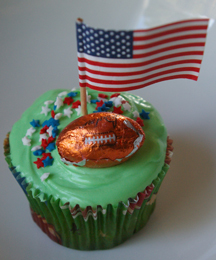 What You Need: 1 cupcake; green frosting; red, white, and blue star sprinkles; paper flag; foil-wrapped chocolate football. How to Make It: Frost cupcake. Insert flag pick and rest football next to it. Sprinkle a few stars. 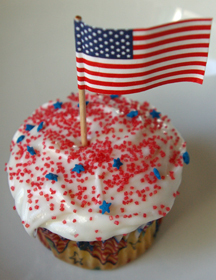 Little paper flags instantly turn any red, white and blue cupcake into an Independence Day celebration. What You Need: 1 cupcake; white frosting (I used “fluffy” by Pillsbury); red sugar; blue star sprinkles; paper American flag. How to Make It: Frost cupcake generously. Sprinkle with red sugar and blue stars. Add American flag. 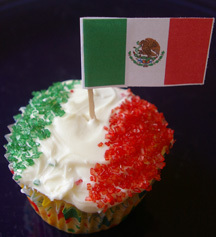 What You Need: 1 cupcake; white or off-white frosting; green sugar; red sugar; Mexican flag pick; strip of cardstock or index card; scissors. How to Make It: Frost cupcake. Cut a strip from cardstock or index card about 3/4″ wide. Holding strip slightly above cupcake to block off the center, sprinkle green sugar on the left side of the cupcake and red sugar on the right side. Add Mexican flag pick to center.